This rather short iris species is popular in gardens, but it is wonderful to see it growing as wildflower in its natural habitat. 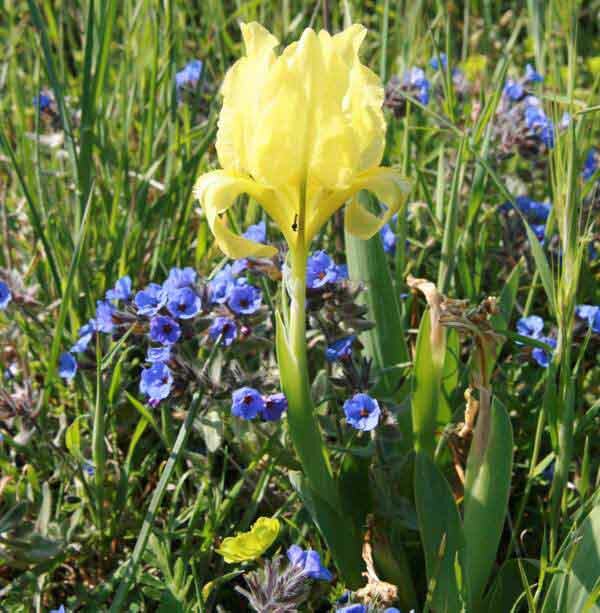 The sword-like leaves of Iris lutescens are very slightly curved, dark green and loosely arranged. The flowers are beautifully coloured and vary between almost white to pale yellow sometimes with purple tinges towards the outer edges. This lovely flower blooms during March and April and can be found in parts of Southern Europe including the Iberian Peninsula, Southern France and in Italy. It's classic habitat is on rocky outcrops (sometimes rather inaccessible rocky outcrops! ), but it also occurs in open pine woodlands.